Who’s Responsible For Canceling The Los Angeles Triathlon? Last Thursday, triathletes in Southern California woke up to shocking news: There would be no L.A. Triathlon for the first time in 15 years; the race, scheduled to run just three days later on Sept. 11, had been cancelled. This is the second time race director and founder of Pacific Sports, LLC, Jack Caress, has canceled a triathlon within a week of race day, leaving racers to wonder whether his production company or the cities that host the events are to blame for their missed opportunity to compete. Caress announced the L.A. Tri’s cancellation in a note emailed to 400 participants and posted on the L.A. Triathlon website on Sept. 8. He wrote that he was forced to cancel after receiving an email on Aug. 31 from the City of Torrance, which has hosted the L.A. Triathlon since 2014. “First, they admitted to overbilling us for our event last year,” says Caress. “Then, just a few lines later, they told us that they needed upfront payment, in the form of a cashier’s check, by 5 p.m. on Sept. 6.” Caress says he was shocked, particularly as he says that the city wouldn’t send an itemized bill. Furthermore, he says, the email came with a request for $7,200 to be paid to the neighboring City of Palos Verdes Estates, despite the fact that the race is contained entirely in Torrance. Caress says neither he nor anyone else he knows working in race production has ever heard of having to pay a nearby city. The City of Torrance explained its side in an official press release and in an interview with Triathlete. “[Caress] was fully aware of what the breakdown was,” and “did know what the billing was for,” says Fran Fulton, the city’s economic development manager. Fulton says that her office and Caress had had monthly meetings leading up to the event and that “if he had disputes, he had several months to bring it up.” She says the prepayment policy had been in place for the past two years, and nothing about it changed in 2016. She also says overbilling is common with city event planning. “We always do estimates based on the numbers we have,” she says. “Oftentimes [the estimate is] higher, but we always reimburse that amount.” Finally, she explained that the $7,200 fee would have paid for the City of Palos Verdes Estates to put up message boards advising drivers that one of the main routes into that city would be closed during the event. This isn’t the first time Caress abruptly cancelled a race over billing disputes with a city. 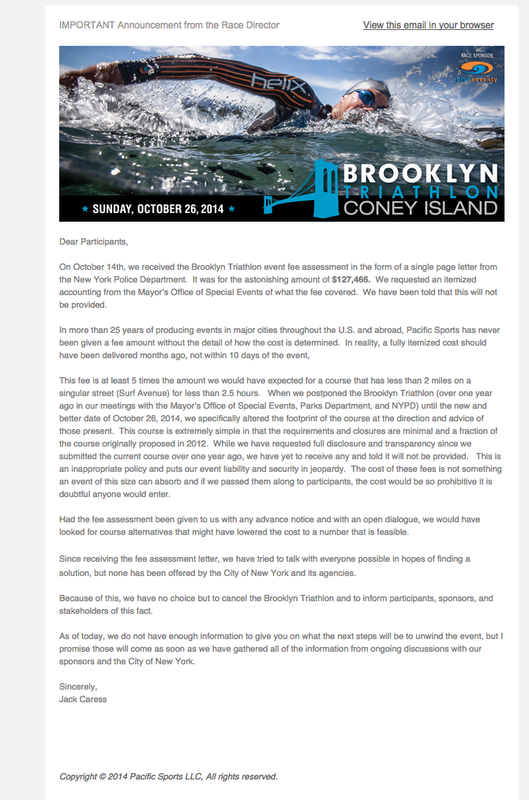 He cancelled the 2014 Brooklyn Triathlon six days before the event, writing in an email to competitors that an unexpectedly high fee assessment the NYPD delivered to him less than two weeks before the race forced the cancellation. The NYPD wanted $127,466 to close two miles of road for three hours, Caress told the Brooklyn Daily—an amount five times higher than he’d expected. While Caress estimated he’d lose $100,000 cancelling the 2014 Brooklyn Triathlon, he says he’ll likely lose $150,000 to $250,000 cancelling Los Angeles this year, though this year’s event did not have a title sponsor. His company is offering racers refunds or transfers to other Pacific Sports events, including the Long Beach and Newport Beach Triathlons, scheduled for Sept. 18 and Oct. 2 respectively. But the real losers here are the athletes who marked Sept. 11 off as race day.